Thrips in high populations can cause significant scarring on leaves that may lead to leaf necrosis and abscission. 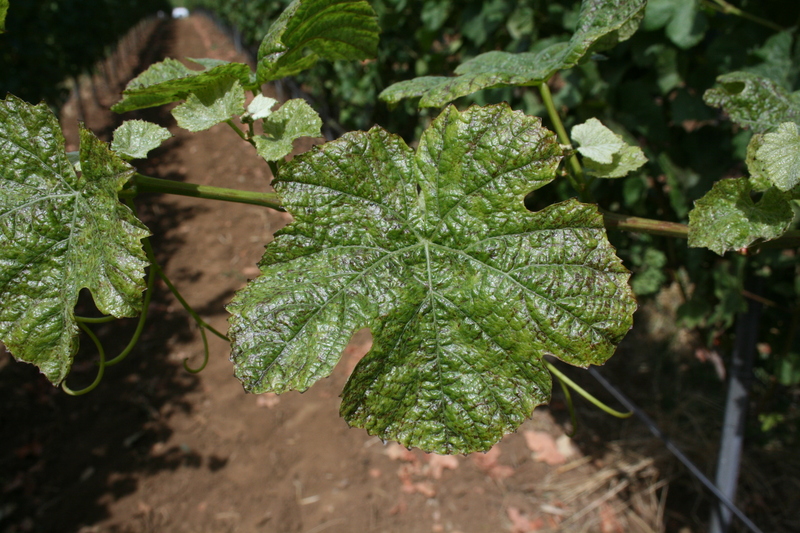 Here is a severely infested Pinot noir leaf in mid-summer in western Oregon. Thrips cause brown lesions or scars on the leaf surfaces during summer. Berry scarring is evident in vineyards with high thrips populations. Here scarring is visible at véraison for Pinot noir. However, the scarring is of less importance for berry quality in wine grapes than table grapes. Pest description and crop damage Thrips commonly found on grapes are approximately 0.04 to 0.6 inch in size. Adult thrips have feather-shaped wings. Nymphs are wingless and usually yellow-orange. They usually appear at bloom as they feed on pollen and tender tissues. 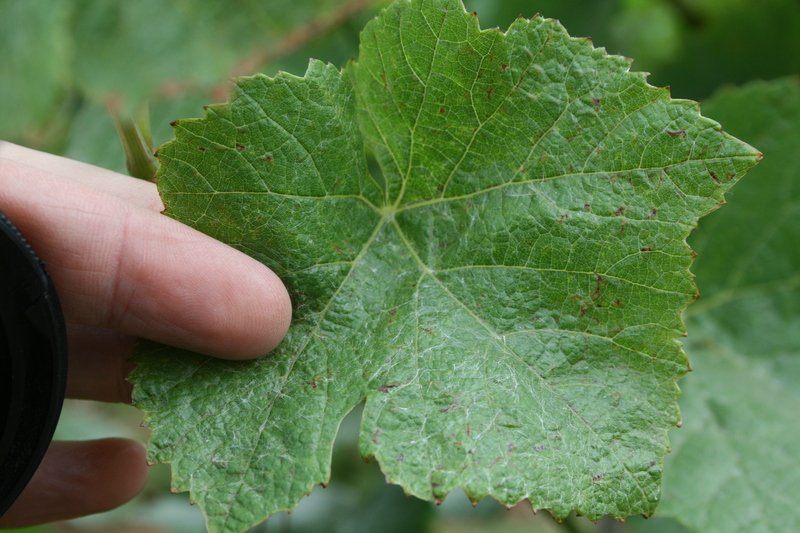 However, thrips have been found in early spring in Oregon vineyards, much earlier than bloom. Thrips may scar very young berries as early as fruit set. Later, the scars can restrict berry growth, producing oddly shaped or scarred berries. Occasionally, large populations of thrips may damage shoots and leaves in spring, particularly when cool conditions restrict plant growth. Damage caused by thrips during this period has been reported to be similar to that of rust and bud mites (leaf deformation and shoot scarring). High thrips populations have been observed in western Oregon vineyards and have led to strange growth patterns; however, economic damage was not reported. 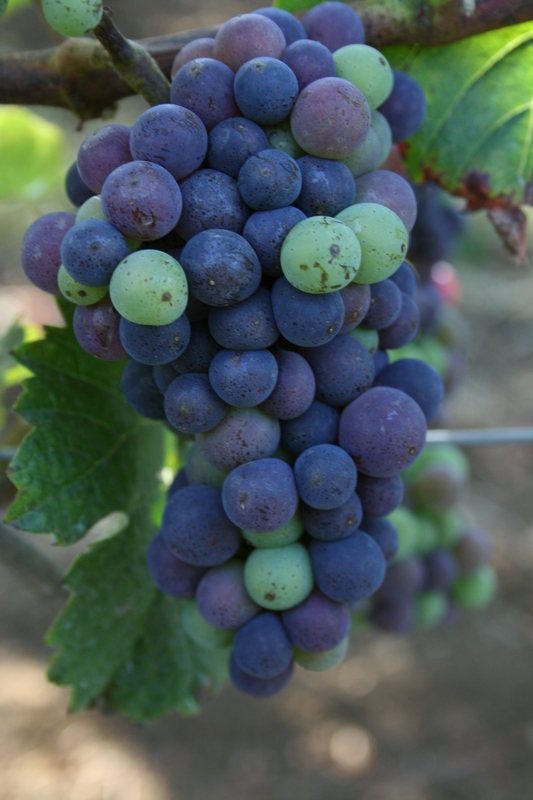 Damage is usually minor and cosmetic on wine and juice grapes in the Pacific Northwest. These are of cosmetic concern for table grape production. Extremely high populations that cause greater damage are usually found in vineyards located near alternative wild hosts. Biology and life history Western flower thrips appear to be the most important species on grapes in the Pacific Northwest. This species has up to five or six generations per year. Populations usually peak during spring, which may be a result of migration into vineyards from surrounding host plants that are beginning to senesce. Thrips overwinter as adults or nymphs. Reproduction may be sexual or asexual. The minute eggs are laid in soft tissue, particularly in flowers. Each female lays about 20 eggs that hatch in about 5 days. Nymphs feed on the host through two nymphal stages lasting 7 to 12 days. Pupation occurs in soil debris. Adult thrips feed on pollen as well as plant tissues. Scarring has been observed on stem, leaf and berry tissue in Oregon. Grape thrips overwinter as virgin females in the soil; populations usually reach a peak in midsummer. This species may be mostly responsible for young leaf and new growth damage during summer. Sampling and thresholds Thrips populations can be determined by counting nymphs and adults that have been knocked out of flowers or fruit clusters onto a board or into a container. Reliable thresholds have not been developed, although numbers in the range of 5 to 30 thrips per cluster are unlikely to be damaging. Populations on leaves can be identified using leaf washes in spring and summer using the alcohol wash as described for rust mites. Little is known about natural control of thrips in vineyards. Some predatory mites, predatory bugs, and spiders are known to feed on them. kaolin-Applied as a spray to foliage, flowers and fruit, it acts as a repellent to some insect pests. Some formulations are OMRI-listed for organic use. azadirachtin (Aza-Direct, Neemix and other brands)-Rate varies with specific product, consult label for rate. PHI 0 days. Some formulations are OMRI-listed for organic use. kaolin clay (Surround WP) at 23.75 to 47.5 lb ai/a (25 to 50 lb/a product). The preferred rate is 25 lb of product in 50 gal/a water. For suppression only; supplemental controls may be needed for complete control. Make one to two applications 7 days apart, starting at budbreak. Product may not adhere well to berries early in development (best adherence at véraison and after). See label for specific instructions on use in table, raisin and wine grapes, including information on how harvest may be altered. OMRI-listed for organic use. insecticidal soap (M-Pede and other brands) at rates between 0.25 to 4% (see label). Higher rates are used for stand-alone application but 1-2% is used in tank mixes. This is a contact insecticide, and efficacy is related to the solution concentration and contact with the pest. Some formulations are OMRI-listed for organic use. Do not use on Calmeria or Italia grape varieties. Do not mix with sulfur. PHI 0 days. spinetoram (Delegate WG) at 0.047 to 0.078 lb ai/a. PHI 7 days. Retreatment interval 4 days. Do not make more than 5 applications per season or exceed 0.305 lb ai/a. Group 5 insecticide. Do not use Group 5 insecticides more than twice consecutively. spinosad (Entrust or Success) at 0.065 to 0.125 lb ai/a. PHI 7 days. Treat when pest first appears. Heavy infestations may require repeat applications. Do not exceed 0.45 lb ai/a of Entrust or Success per season. Do not exceed three applications in any 30-day period. Allow at least 5 days between applications. Entrust is OMRI-listed for organic use; Success is not approved for organic production. Group 5 insecticide. Do not use Group 5 insecticides more than twice consecutively.